I'm Sewing Along Next Week, Are You? Have you guys seen this sew-along? It starts on Monday, October 18th over at Craftiness is not Optional. This is Jess's first sew-along tutorial, and I immediately signed up (because she's awesome, and I completely forgot the five other projects I am in the middle of and the Halloween costume I have yet to start. Oops!). This shirt is so cute, and I can't wait to get started. My oldest and I are going to pick out the fabric today. I've never sewn a shirt before, and this is my first time participating in a sew-along. The only clothing I've ever sewn was the girls' Easter dresses this year. 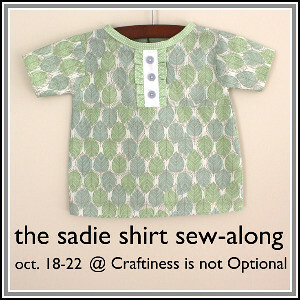 If my first Sadie Shirt goes well, I'm going to make another one for my youngest. I'll post some updates on my progress throughout next week and give you the big reveal (good or bad) when it's complete. If you are interested in participating, click here for all the details. If you have a little girl or know a little girl, go check it out. I just know it's going to be a lot of fun. Hope to see you there! I'm excited to see how this turns out. I wish I had time to do this next week. maybe I'll try to squeeze it in- it's so darn cute!